Doesn’t time fly? Not so long ago the idea of a computer model of a musical instrument that you could actually play would have seemed like science fiction. 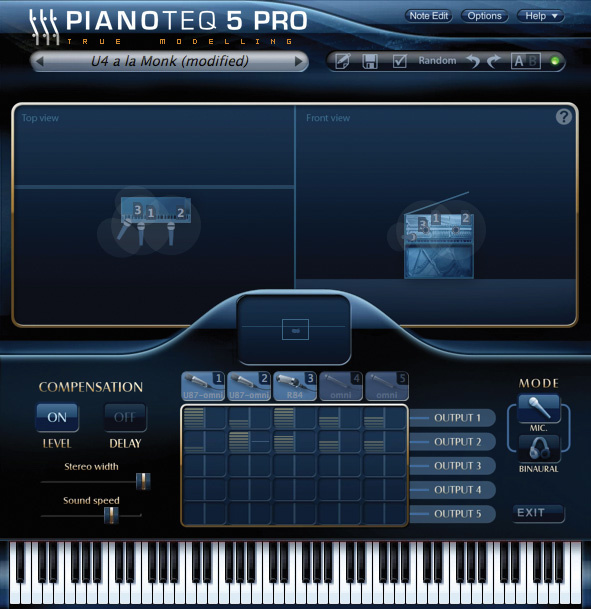 And yet, it’s already been nearly a decade since French developers Modartt first released their modelled piano software, Pianoteq. In that time they’ve subjected it to continuous development, refining the basic acoustic model, and releasing new pianos and other instruments to run within it. So with this latest version 5 Pianoteq is more capable and flexible than ever, and that’s been matched by some important changes in the way it’s sold, as we’ll see. Pianoteq runs in OS X, Windows, and Linux. You’ll need OS 10.5 or later, Windows XP, Vista, 7 or 8, or Linux (x86) with Jack and ALSA back ends. There are 32– and 64–bit variants, and as well a stand–alone version it’s provided in VST, RTAS and AAX plug–in formats for OS X/Windows, as well as in Audio Units for OS X. Fully equipped, Pianoteq offers an embarrassment of riches; pianos, electric pianos, and many different mallet percussion sounds. After you’ve chosen your basic sound ‘flavour’ at purchase, additional instruments are available for €49/$89 a pop.Then, regardless of your chosen platform, the installation size is almost incomprehensibly, laughably tiny — at least compared to any half–decent sampled piano competition. It occupies a mere 40MB or so on your hard drive, which to put it in perspective is over 3000 times smaller than Garritan’s CFX Concert Grand. Pianoteq doesn’t require much memory either — 256MB is sufficient. That makes it very suitable for users of laptops with solid-state drives, for example, which may not have a great deal of storage capacity. A modest multi–core chip like Intel’s Core i3 is recommended as the minimum spec for the CPU. 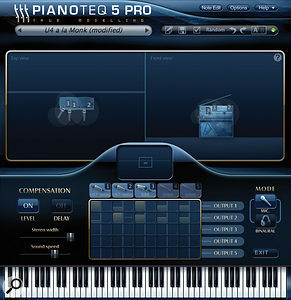 Pianoteq 5 Pro, €399$789. This most expensive variant offers the full, unrestricted Pianoteq experience. There’s huge scope for sound design, even on a note–by–note basis (which pretty much lets you do ‘prepared’ piano setups, à la John Cage). There’s a surround–capable multi–channel virtual miking scheme, you can load your own impulse responses into the onboard convolution reverb, and supported sample rates stretch to 192kHz. Pianoteq 5 Standard, €249$489. Still very capable, Standard forgoes only the high sample-rate support and per–note sculpting of Pro. Interestingly, though, it’ll actually load Pro presets, with per–note adjustments intact — you just won’t be able to alter them yourself. 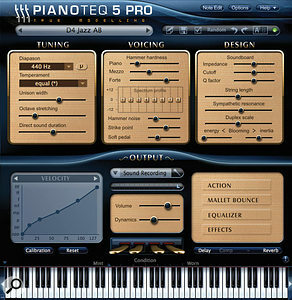 Pianoteq 5 Stage, €99$199. Notably more limited, Stage has a smaller interface, lacking several sections of Pro and Standard, and dropping most of their sound-tweaking features. And while presets saved from those more expensive versions will load into Stage, many of their more advanced parameter settings will be ignored. However, the basic sound engine, playability and potential for expansion is the same. Something that has changed in version 5 is the possibility to choose, when purchasing any of the three versions, which ‘flavour’ of Pianoteq you want to go with. The ‘Acoustic piano’ flavour equips you with the D4 and K2 acoustic grand models, while ‘Electric piano’ provides the R2 Rhodes and W1 Wurtlitzer electro-acoustics and the CL1 Clavinet. Finally ‘Chromatic percussions’ includes vibraphones, a xylophone and a bass marimba. So yes, you read that right: it’s quite possible to purchase Pianoteq and end up not having any pianos on hand. A bit unexpected maybe, but quite a smart move on Modartt’s part, I think. Why not let electric piano players and those seeking an alternative to percussion sample libraries benefit from the space–saving and flexibility benefits of acoustic modelling? Not all of us are (acoustic) pianists, first and foremost. 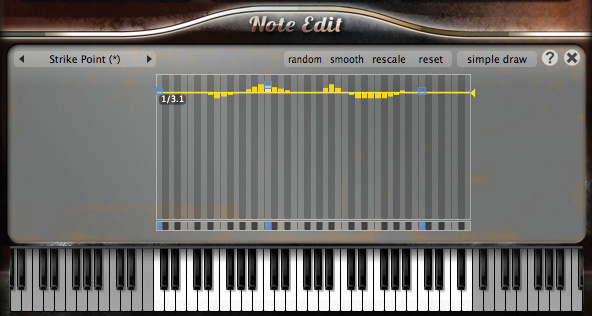 As you switch between Pianoteq instruments different interface skins appear, often with unique parameters. For example the R2 Rhodes piano includes adjustments for pickup symmetry and distance. Also shown here is the Effects section overlay, with its three configurable slots and convolution reverb. 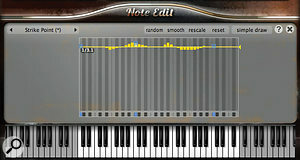 One of the perks of the most expensive Pianoteq Pro version is the potential of its per–note editing. With 28 parameters available it can be used to put a single note out of tune, or to sculpt crazy ‘prepared’ or fantasy instruments that have no parallel in reality.This new flexibility in the basic sound provision really just points to the fact that, whatever flavour you do initially choose, Pianoteq has long been about much more than just pianos. It’s massively expandable — you might even say ‘modular’ — and the new purchasing scheme just helps new users end up with the sounds they want, with fewer of those they don’t. D4 Concert Grand. An updated version of that ever–popular and prized Steinway model D (from Hamburg, rather than New York). K2 Grand Piano. A brand-new 6-foot, 11-inch acoustic grand sound, not a copy of a specific original, but an amalgamation of several. Blüthner Model 1. An officially licensed modelled version of this concert grand that has four strings rather than the normal three in the treble region, also enhanced for Pianoteq 5. Rock Piano YC5. A Yamaha grand in all but name, suitable for (though by no means limited to) pop and rock, thanks to a bright and clear timbre. U4. A Yamaha–style upright, capable of sounding both sophisticated and clapped–out, and with a tendency for typical inharmonicity in the bass. Schloss Kremsegg Collection 1. Copies of historical pianos from the Kremsegg Schloss Museum in Austria: grands by Dohnal (1795), Besendorfer (sic) (1829), Erard (1849) and Streicher (1852). Schloss Kremsegg collection 2. More old grands: Broadwood (1796), Pleyel (1835), Frenzel (1841), Bechstein (1899). Clavinet CL1. A Hohner D6 clavinet with full support for the original’s pickup modes. Electric pianos R2 & W1. Rhodes and Wurlitzer electro-acoustics. Steel pans. Four separate instruments: steel drum, spacedrum, hand pan and tank drum. Vibes. Models of an American Musser and a French Bergerault vibraphone. Celeste. Three different celeste–like instruments: Celesta, glockenspiel and a toy piano. Xylo. A three-and-a-half-octave xylophone and a five-octave bass marimba. Given that all of these sounds can be really messed with in Pianoteq Pro and Standard, it’s clear Pianoteq is a potent sound source for all kinds of keyboard and mallet instruments. And if you’re busy totting up what it would cost to ‘max out’ a Pianoteq installation, buying Pro and all the Instrument Packs, let me save you the trouble. Modartt actually sells it as a special cost–saving bundle, Pianoteq Studio, for €649$1199. The intricacies of Pianoteq’s sound engine, and the parameters it exposes for users to manipulate, is quite rightly fascinating, and is an important part of what separates it from sample–based competitors. Just a cursory glance at some of the screenshots in this review reveal it’s nothing like a typical subtractive synth’s architecture of oscillators, filters and modulators. Instead, it’s all about the actual physical model; the equivalents of real physical entities in a mathematical domain. For a really full discussion of what’s on offer, particularly with regard to the per–note piano-design possibilities, and the special parameters exposed for non–piano instruments, you might want to check out my review of Pianoteq 4 in the September 2012 issue of SOS. For now, I’ll focus on version 5’s new abilities, which are many and varied. First, the physical models of the D4, Blüthner, YC5 and U4 pianos have all been further refined, resulting in an improvement in sound quality and playing experience. Then there’s that brand-new K2 piano and the Kremsegg historical grands collection, which I already mentioned in the add–on sounds list above. Next, a lot of work has taken place in Pianoteq’s ‘Sound Recording’ virtual miking scheme. This is, for all intents and purposes, an ‘imager’, albeit a very sophisticated one that works for stereo as well as multi–channel environments. You get to place up to five virtual mics around your virtual piano or other instrument (excluding the CP80, any of the electric pianos, or the church bells) in what is a kind of anechoic environment. There’s a top view and plan view to help you envisage the setup, with cute depictions of the instruments, though no distance scales or displays. Then the feeds from those virtual mics pass through a mixing matrix, allowing each to feed multiple channels, and for inter–mic delays to be set up. The whole lot feeds the reverb and other effects, with a view to creating natural as well as unnatural and creative audio perspectives. Additional options are there to turn on level and delay compensation, which does away with the natural behaviour of more distant mics, producing a feebler and later signal. Or you can forget the whole thing and engage a special binaural mode for that scarily real headphones vibe. 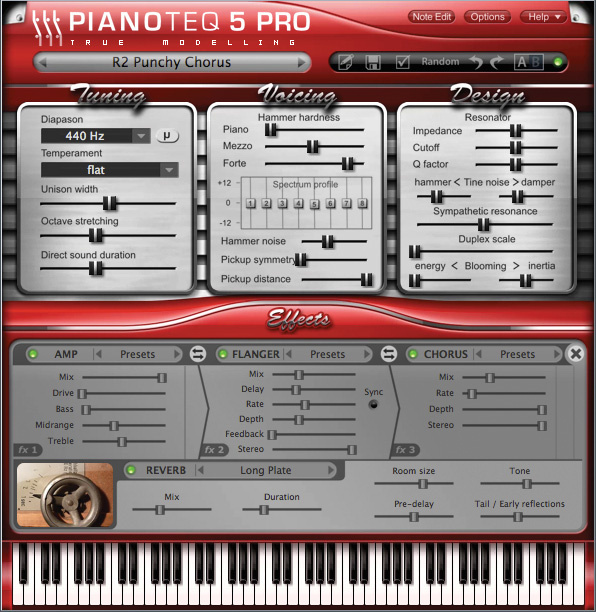 Pianoteq’s virtual miking system has been supercharged for version 5. Now there are specific mic models, with varying directional characteristics. In the interface for miking the U4 upright piano, shown here, you even get to adjust the position of a virtual wall — the horizontal line shown in the left-hand plan view.In Pianoteq 5 the entire Sound Recording scheme has apparently been souped–up, and you now get to choose between different models of mics, some with directional characteristics, and separately for each channel. There’s a virtual U87 and C414, each offering omni, cardioid and figure-of-eight responses. There’s also a collection of small-diaphragm fixed-pattern condensers: DPA 4006, 4007, 4011 and 4041, along with Schoeps CMC62 and 64. For ribbon aficionados there are Royer SF12 and 24 models, and an AEA R84. Then there’s a duo of so–called ‘perfect’ omni and figure-of-eight mics, which presumably represent the ultra–neutral, ruler–flat backdrop against which the big–name mics’ characters can emerge. I was interested to dive into the new features, because I’d previously identified the virtual miking as one of my least-favourite bits of Pianoteq 4. I’d felt that any usefulness of the imaging aspect was outweighed by the imposition of a slightly artificial twang in the sound, and more often than not I preferred to bypass the whole thing entirely, with the ‘Stereophonic’ output mode. Well, in Pianoteq 5, the situation seems markedly improved. Of course, some piano models have changed too, so in some cases we’re not comparing like for like. However, I no longer had the same urge to switch Sound Recording mode off (though the super–clean Stereophonic feed is still useful to have around). Quite the opposite in fact; experiments with placing and angling arrays of virtual mics produces interesting and really substantial differences in the sound, just as in reality. As well as offering preset and user–adjustable velocity curves, a built–in calibration offers to precisely match Pianoteq’s dynamic response to your controller.As for character differences between all those drool–worthy mics, they’re very subtle. The Schoeps and R84 sound a touch fuller than the Royers. The C414 and U87 are bright and accurate, but depending on placement there sometimes isn’t much difference between the patterns. Applying the ‘would my granny notice any difference?’ test, I fancy she wouldn’t have the faintest clue (bless her), unless she happened to be a mastering engineer on the quiet. Certainly, changing a mic’s position always produced a much bigger change in character than changing it for another model. As such, it might be good to have further models, perhaps ‘Cheap Chinese condenser’ or ’20-year–old repeatedly dropped SM58’. Facetious, maybe, but some more extreme, borderline grotty mics might make for interesting creative treatments. It’s fair to say that early piano–only versions of Pianoteq lagged a fair way behind the sampled opposition in terms of sheer realism of the sound. Playability, though, and the sense of musical involvement was a different matter, with Pianoteq often feeling rewarding and inspiring where sample libraries could be strangely lifeless, no matter how good individual notes sounded. More recently the position has changed a bit. Pianoteq’s pianos have steadily and significantly improved with every new version, while sacrificing none of the playability. But the sample–based alternatives have also got better, with the very best now sounding great and feeling good too, albeit often at the cost of massive installation size. So where are we now, with Pianoteq 5? That question needs to be answered in several parts. Pianoteq’s non–piano sounds — those Rhodes, Wurlis and percussion instruments — I always thought were superb, from day one, and nothing has changed in that respect. It’s all too easy to overlook them, as if they were some sort of bonus or afterthought, but that would be a grave mistake if you have any use for these kind of sounds. In my view they still represent the state of the art, and in many cases are much preferable to samples. Some of the Rhodes presets, for example, are stunning, to hear and to play. I also find the vibraphones, marimba, xylophone and those evocative hand pans utterly convincing, and it’s hard to imagine how they could be bettered. And of course in Pianoteq Pro and Standard all the sounds can be extensively edited. Simply put, everyone in the market for these kinds of sounds should seriously consider Pianoteq instead of a sample library, and the new purchasing ‘flavour’ options should help in this respect. As for the main acoustic pianos, the simple fact is that Pianoteq 5’s represent another leap forward, and the quality is now uniformly high. The D4 Steinway has that rather serious, arrogant quality of the real thing; not immediately attractive, but commanding, immensely ‘respectable’ and musically potent. The K2 is more like a big Yamaha — instantly likeable, willing, open, but still classy. The Blüthner sounds scarily like the one my old piano teacher had; middly, insistent, a touch ‘vintage’ with a really thick and chalky high-treble register. And the YC5 provides an interesting contrast, being enthusiastic but certainly not too strident or coarse. Finally, the U4 is in no way a poor relation to the grands, and can sound surprisingly elegant as well as characterful and aged (think ‘Good Day Sunshine’ or ‘I Don’t Like Mondays’). What’s obvious, with these improved pianos, is that the slightly artificial, plasticky twang of previous Pianoteq versions has all but disappeared. It was by no means the defining feature of the sound, but you could sometimes sense it in the octave below middle-C, as a sort of stiffness and sterility. This time round I found myself playing the Pianoteq pianos and thinking they sounded really beautiful, and that had not happened with any previous versions. I still think we might hear further improvements in future versions, but right now I’d have no hesitation in choosing Pianoteq instead of a sampled piano for almost any job. The character and quality is great, and that sound-design potential, as well as the instant loading of presets, is something you can only dream of with samples. Other more general aspects of use also make Pianoteq very easy to live with. No copy–protection dongle is required. CPU efficiency is good (typically never using more than 15 percent of my 2.2GHz quad–core i7 at a responsive 128–sample buffer size, and with the convolution reverb enabled) and can be managed with a maximum polyphony parameter. The user interface is clear, elegant and resizable. On–board effects (Tremolo, Wah, Chorus, Flanger, Delay, Compressor and an Amp sim, available in three slots) are of really nice quality, have their own preset system, and are easy to control. The convolution reverb unfussily loads any WAV as an impulse, and sounds excellent with the factory acoustics too, which include typical rooms and halls as well as springs, plates and a small speaker. There’s very flexible MIDI mapping for almost all parameters and preset functions. And, finally, installation of sounds and all authorisation functions are quick and straightforward. All things considered, it seems that something really momentous has taken place with the release of Pianoteq 5. It was always easy to admire what Modartt were doing, and be excited by the technology, but in the past you had to buy into the modelling approach somewhat. Yes, there was immense flexibility and other benefits, but you couldn’t escape some hints of artificiality in the sound of the flagship acoustic pianos. In Pianoteq 5 that artificiality has pretty much vanished. Obsessive virtual piano nerds could probably still pick out Pianoteq in a line–up of the usual suspects, but even they might hesitate now. Pianoteq’s acoustic piano line–up is formidable, covering four centuries and every musical style imaginable. The electric piano and percussion instrument sounds are truly top class. There’s also colossal potential for sound design. And all this for a presence on your hard drive that’s close to undetectable. This is an outstanding, mature product, and I can’t recommend it highly enough. While there is some other acoustic-modelling piano–oriented software out there, none of it comes close to Pianoteq when all is considered. The best–sounding alternatives are all sample based, and include Synthogy’s 80GB Ivory II Grand Pianos and Garritan’s 130GB CFX Concert Grand. There’s no question that these modern sampled piano instruments sound superb, and are at least as responsive and musical as Pianoteq — you might even find them a bit cheaper. The flipside though is that hefty installation size, corresponding demands on disk mechanisms and data throughput, and limited scope for sound editing. The competition is fierce in this sector — and hooray for that. It’s not actually necessary to spend any money to expand Pianoteq’s instrument line–up as Modartt offer a number of add–on instruments as free downloads. Perhaps the coolest is a Yamaha CP80 electro-acoustic. Then there are seven historical pianos: exquisite small grands by Schantz, Schmidt and Walter from around 1790, bigger Romantic–era models by Schöffstoss (1812) and Graf (1826), and almost–antiques from Erard (1922) and Pleyel (1926). They’re supplemented by an Italian and French harpsichord, a modern Kov cs Cimbalom, a reproduction Neupert clavichord from 1941, a set of tubular bells, a carillon and a big peal of church bells. It’s a great selection, and of remarkably high quality overall. The CP80 is ballsy and inharmonic as hell. All the early pianos ooze character, and the early 20th century ones are especially refined and attractive. Only the harpsichords, clavichord and cimbalom aren’t convincing to my ears, though that in itself doesn’t prevent them from still being useful. This generosity on the part of Modartt is matched by the fairness of their upgrade pricing. Essentially, if you choose any of the three upgrade paths (Stage to Standard, Standard to Pro, Stage to Pro) you only pay the difference in cost between the versions. Also, users of older versions have only to pay €29 to get on board with v5, and the upgrade automatically includes the D4 and K2 grands. Can generate a wide range of fine–sounding, musically compelling acoustic pianos, electric pianos and percussion instruments. ‘Flavour’ options at time of purchase give users more choice over the unexpanded sound palette — it isn’t only for acoustic pianos. Standard and Pro versions expose sound-design parameters unthinkable for a sample–based instrument. Much improved virtual miking environment. A fully featured demo version is available. Rather costly to ‘max out’ with Instrument Packs, though a money-saving bundle is available for new purchasers. Differences between modelled mics perhaps a bit too subtle. This is the Pianoteq we’ve always wanted. Musical, flexible, efficient, lean, and now truly comparable with the sound quality of the sampled opposition. 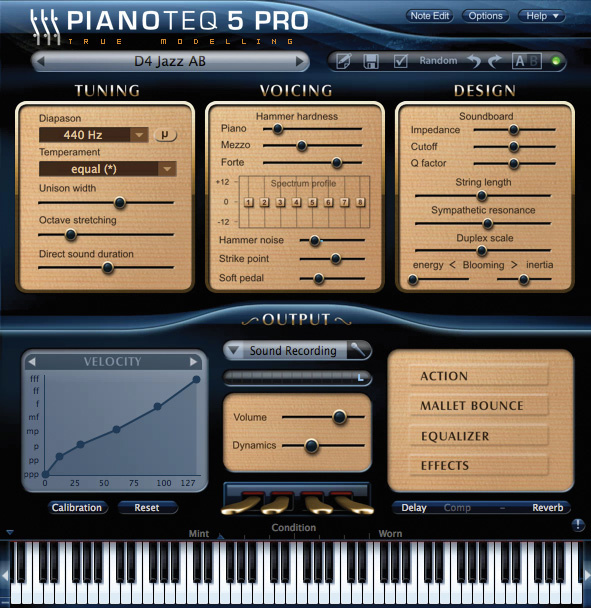 Pianoteq 5 Pro €399, Pianoteq 5 Standard €249, Pianoteq 5 Stage €99. Prices include VAT. Apple 2.2GHz Intel Core i7 MacBook Pro, 16GB RAM, OS 10.10.1.